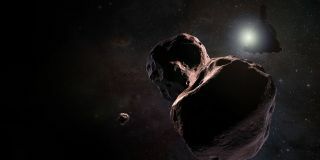 Artist's illustration of NASA's New Horizons spacecraft encountering 2014 MU69, a Kuiper Belt object that orbits 1 billion miles (1.6 billion kilometers) beyond Pluto. The encounter will occur on Jan. 1, 2019. With public input, the team has selected the nickname Ultima Thule for the object, which will be the most primitive and most distant world ever explored by a spacecraft. The New Horizons spacecraft's next flyby target now has a nickname befitting the object's exotic nature and locale. On Jan. 1, 2019, the NASA probe will zoom by a small object officially known as 2014 MU69, which lies about 1 billion miles (1.6 billion kilometers) beyond the orbit of Pluto. In the process, MU69 will become the most distant object ever observed up close. "MU69 is humanity's next Ultima Thule," New Horizons principal investigator Alan Stern, from the Southwest Research Institute in Boulder, Colorado, said in a statement. "Our spacecraft is heading beyond the limits of the known worlds, to what will be this mission's next achievement," Stern added. "Since this will be the farthest exploration of any object in space in history, I like to call our flyby target Ultima, for short, symbolizing this ultimate exploration by NASA and our team." Stern and his colleagues settled on Ultima Thule after reviewing nicknames proposed and voted on by the public during an outreach campaign that ran from November through December 2017. About 115,000 people around the world participated, submitting 34,000 names, NASA officials said. The mission team narrowed this huge pool down to 29 finalists, ultimately choosing Ultima Thule, which was proposed by about 40 different people. "We are grateful to those who proposed such an interesting and inspirational nickname," New Horizons team member and naming campaign leader Mark Showalter, of the SETI (Search for Extraterrestrial Intelligence) Institute in Mountain View, California, said in the same statement. "They deserve credit for capturing the true spirit of exploration that New Horizons embodies." To be clear: Ultima Thule is merely a nickname. After the 2019 flyby, New Horizons scientists will work with NASA and the International Astronomical Union to come up with a new official name for the object, mission team members said. Ultima Thule is an odd, mysterious object. In fact, scientists don't even know if it's a single body; it may be two close-orbiting objects, each of which is about 12 miles (19 km) wide, New Horizons team members have said. The Jan. 1 encounter will be the second close flyby for the $700 million New Horizons mission. The spacecraft famously flew by Pluto on July 14, 2015, capturing the first-ever good looks at that distant, frigid and complex world.